Canada's Liberal Party has decisively won the country's general election, installing leader Justin Trudeau as the new prime minister. Here are seven ways he might reshape policy, at home and abroad. During the election campaign, Mr Trudeau indicated he would withdraw Canada's CF-18 bombers from the coalition mission against Islamic State militants in Iraq and Syria. He argued that there are better ways to take on IS, such as bolstering local forces on the ground and increasing humanitarian aid. Earlier this year, Mr Trudeau and his Liberal party opted not to support the Conservative government's motion to extend combat operations in Iraq and expand them to Syria. Under Stephen Harper's governance, relations between the US and Canada were strained. One of the reasons behind this was the issue of the Keystone XL pipeline, which would send Canadian oil to America. President Obama vetoed the plan citing environmental concerns, a move which angered Mr Harper who hoped it would create jobs for Canadians. While Justin Trudeau also supports Keystone XL, he says he wants to work with the US to address some of those concerns. He said building a constructive and productive relationship with President Obama was a crucial priority for him. The case of the young Syrian refugee Alan Kurdi shocked people worldwide, but it had particular resonance in Canada after it emerged that the Kurdi family had hoped to move to the country to join family. The story thrust the refugee issue into the centre of the campaign. Mr Trudeau promised the Liberals would accept more refugees than any of the other parties - 25,000 by January 2016, an increase on the 10,000 promised by the Conservatives. He has also pledged to invest more money to speed up the processing of refugee applications. The environment was one of the top issues for Canadian voters in this election. Justin Trudeau offers a distinct policy from the outgoing Conservative government in this regard. While Stephen Harper refused to sign up to international climate agreements - and even withdrew Canada from the Kyoto Protocol - Mr Trudeau has promised decisive action on climate change. He's pledged to set targets to reduce carbon emissions, and to fund ways to help provinces achieve those goals. He's also committed to attending the UN climate summit in Paris later this year. One of Mr Trudeau's most eye-catching policies during the campaign was his promise to legalise marijuana. He said the current system didn't work, and ended up criminalising too many people for possessing small amounts of the drug. He said if his party won office they'd get to work on the policy "right away". He hasn't set out a tax rate for marijuana or details of how it would be regulated, but he has said it would be done responsibly. During the campaign his Conservative opponents were critical of his plans, arguing the drug would end up being sold in corner stores, making it easier for young children to get their hands on it. Mr Trudeau has promised a public inquiry into why as many as 1,200 aboriginal women and girls have been murdered or gone missing in the country. 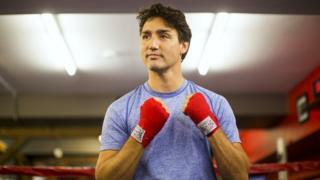 He has also said he wants to focus on improving relations with Canada's indigenous community. Stephen Harper's government cut diplomatic ties with Iran in 2012, closing the Canadian Embassy in Tehran and expelling Iranian diplomats from Canada. Justin Trudeau has said he plans to restore relations between the two nations, in the wake of the Iranian nuclear deal. There's a large Iranian diaspora in Canada. After the Iranian revolution in 1979, thousands moved to Canada in the years which followed. As of 2011, there were 163,290 Iranians in the country.